An 88-year-old woman was fatally struck by a Con Ed truck that was making a left hand turn from Avenue C onto East 16th Street, police said last Wednesday. The woman, who has been identified as Stuyvesant Town resident Stella Huang, was hit at around 5:15 p.m. and taken to Bellevue, where she was pronounced dead. She was killed close to her home at 271 Avenue C.
The Con Ed Truck remained at the scene and police said the investigation ongoing. Alvarez added that there had been two drivers in the Con Ed truck. Both were taken to a nearby hospital and have since been released with minor injuries. 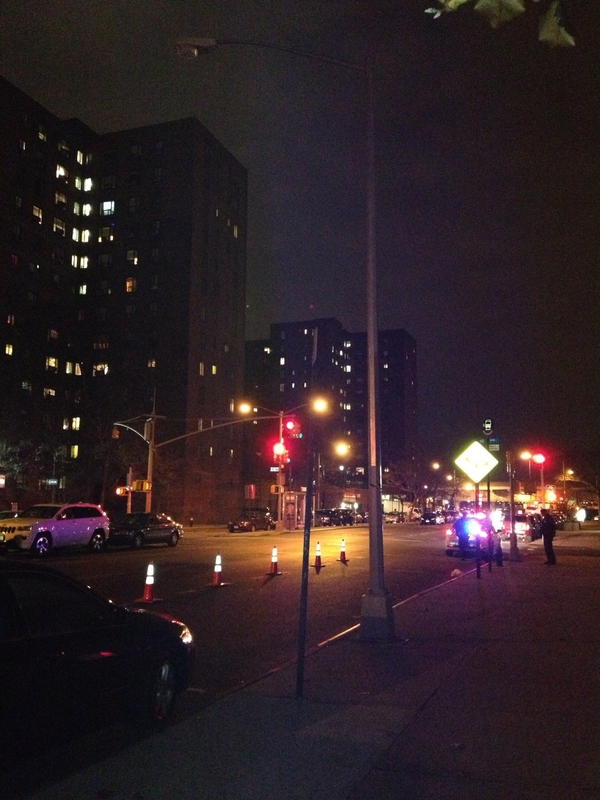 In related news, a streetlight that had been broken for some time at the scene of the accident was fixed on Tuesday. Council Member Dan Garodnick, who was made aware of the light being out on Monday, said his office had contacted the Department of Transportation the next day to get it fixed. Garodnick added that prior to last week’s traffic fatality, said he hadn’t heard complaints about that area being in any way unsafe, although four years ago he helped arrange for the installation of a greenstreet at a nearby intersection, 18th Street and Avenue C. This was to improve traffic safety for little leaguers who frequently crossed that intersection from Stuyvesant Town to Murphy’s Brother’s Park and Con Ed Field. This article has been updated to include statements from Con Ed and Dan Garodnick. We are delighted to see that ground has been broken on Asser Levy Park. However, the closing of Asser Levy has created a problem for eastbound traffic on 23rd Street, which needs to go uptown on First Avenue. A few years ago, a no left turn sign was posted at this intersection for eastbound traffic. To go uptown, people proceeded to Asser Levy, turned left and then left again on 25th Street and then right on First Avenue to proceed uptown. When I discussed this potential problem with Dan Garodnick when the park was being contemplated, I was assured that the traffic signage would be revisited. As 23rd is a major cross-town corridor, uptown access is needed at First Avenue. I checked yesterday and the no left sign is still up. I also wanted to bring to your attention that the streetlights on the 42nd Street FDR off ramp are not working. There are also a number of streetlights on the FDR in the NYU Bellevue area, which are not working. 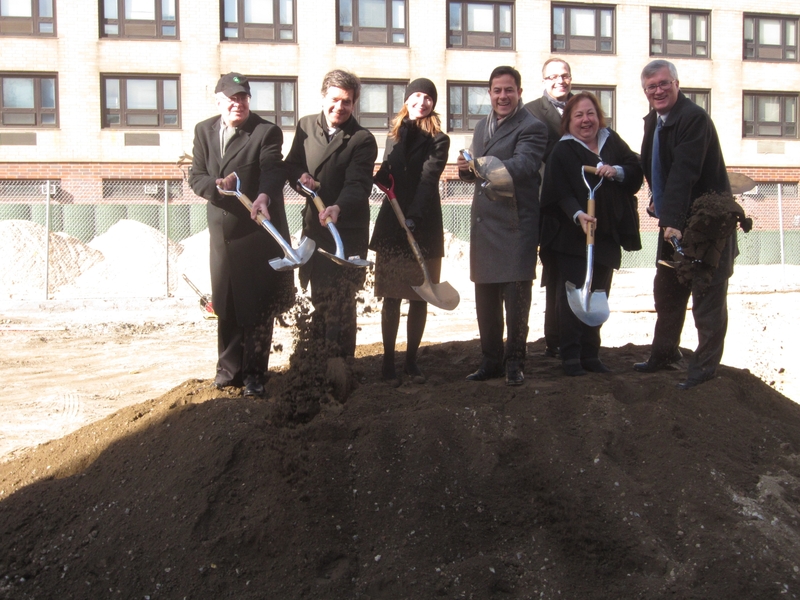 Local elected officials joined the New York City Parks Department and neighborhood residents to celebrate the groundbreaking of the new park planned for Asser Levy Place between East 23rd and 25th Streets on Wednesday. “This underutilized space was screaming for us to do this here,” said City Council Member Dan Garodnick, who helped secure some of the funds for the new park. Garodnick was joined at the ceremony by State Senators Brad Hoylman and Liz Krueger, NYC Parks Commissioner Veronica White, Manhattan Borough Commissioner William Castro, CB6 chair Sandro Sherrod and Assembly Member Brian Kavanagh, who rode a Citi Bike to the event. Kavanagh added that the planned park was the result of a successful land swap and although other parkland was given up, it was beneficial that the city was able to gain more park space in exchange. “This is a very exciting day because we’re doing more to expand our parkland. 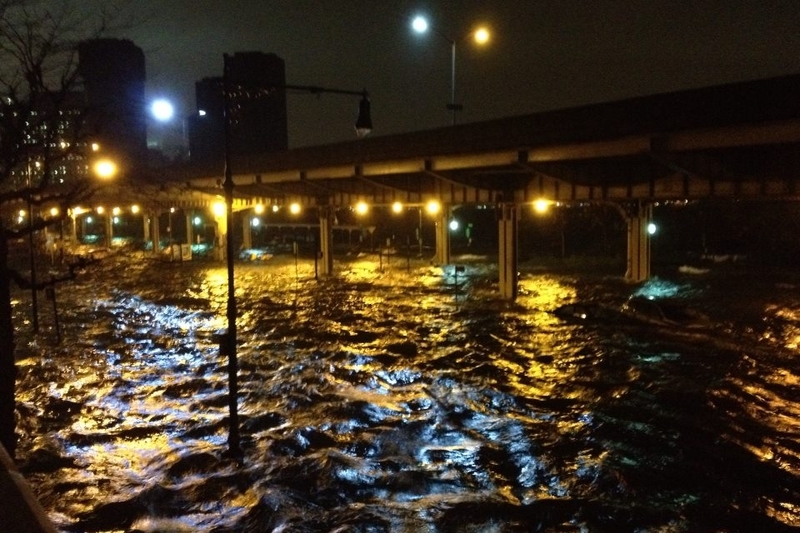 This is just the first piece of a bigger project,” Garodnick added, referring to the plan for the East River Blueway. The new park will be adjacent to the Asser Levy playground and recreation center. The space will serve as a replacement for the parkland lost to the development of a new United Nations building at Robert Moses playground. The new park will offer space for various recreational activities, including ping pong, badminton, volleyball, chess, soccer, football, t-ball and others. There will be an artificial turf field, adult fitness equipment, benches, tables, an exercise track, drinking fountains and trees. The project was funded with allocations of $500,000 from the UN Development Corporation and $1,175,000 from Garodnick and it is expected to be complete by next fall. Residents of Stuyvesant Town/Peter Cooper Village won’t see the recently approved round of MCI rent hikes on their rent bills until after the holidays, CWCapital has announced. A spokesperson for management declined to comment further on the delay to implement the MCIs, which the Tenants Association also mentioned in an email to neighbors sent at around the same time in the afternoon as CW’s. The Tenants Association also noted that it was engaged in discussions with CWCapital and the Division of Housing and Community Renewal (DHCR) of New York Homes and Community Renewal (HCR), the state housing agency. In the past month, tenants have received notices that MCIs (major capital improvements) for security upgrades done in 2009 as well as work done that year on doors, resurfacing and water tanks and valves, had been approved. The Tenants Association has since said it would challenge those MCIs, while CWCapital has made an offer to reduce the MCIs’ retroactive portions by 35 percent if tenants agree not to partake in any challenge. The DHCR, meanwhile, recently agreed to the Tenants Association’s request for reconsideration of the MCIs. With the 50th anniversary of President John F. Kennedy’s assassination coming up, seniors at the Stein Center took a moment earlier this week to tell Town & Village what they were doing when they found out about the historical shooting. Rose Ackrish had a unique experience to recount of the day’s events. She said that she was walking by a bank that was on the corner of East 17th Street near Union Square Park and it was in the process of getting robbed. She said she then went back to her office to tell her coworkers about the incident. For anyone whose apartment is within earshot of a student apartment in ST/PCV, you might find the following information valuable. In fact, this is important information even if you have no students nearby because it can happen at any time. In case you do not know, Stuyvesant Town is listed on the NYU website as a residence hall. The site is full of valuable information for incoming students including the following: Twin beds are provided, but students must bring their own linens. The apartments have kitchens, but students must bring own cookware, dishes and other kitchen supplies. Apartments have hardwood floors; students may bring rugs. Wow! This just keeps getting better and better. The message here is loud and clear: You should avoid disturbing your roommate but don’t worry yourselves about your neighbors – upstairs, downstairs or next door. As luck would have it, the website also provides contact information for both the NYU residence hall director and resource manager and I think it’s time we demand that NYU either insist that students purchase area rugs with padding that adequately cover the floors and absorb the sound or that NYU carpet all apartments they lease in Stuyvesant Town for student housing. The school is supposed to be preparing their students to become part of a larger community and what better time to start than right now in our community. And if they are unwilling, then I would urge any NYU alumni living in the ST/PCV communities to withhold contributions to the school as it is becoming increasingly clear that they have lowered their standards. The U.S. Postal Service, which in May decided to proceed with a plan to move the half-a-century-old Peter Stuyvesant Post Office to a smaller space on East 14th Street, signed paperwork on Friday making the new location official. The new post office, last home to a Duane Reade store, inked a deal to sublease the space between First and Second Avenues for 10 years, the real estate firm Feil Organization announced. The new post office will occupy 6,940 square feet of ground floor space and additional 1,500 square feet of basement. Duane Reade had moved from that space in January. Prior to that, the address was home to a Gristedes. 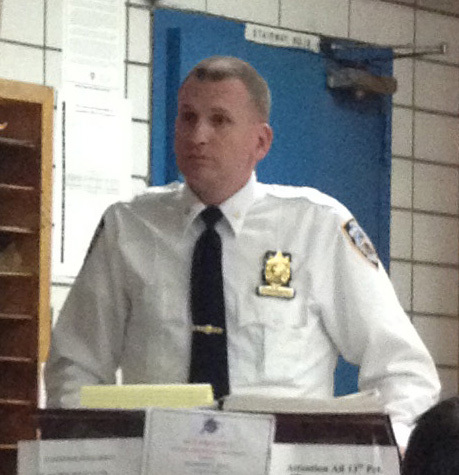 As Town & Village reported back in April, the decision by the U.S.P.S. 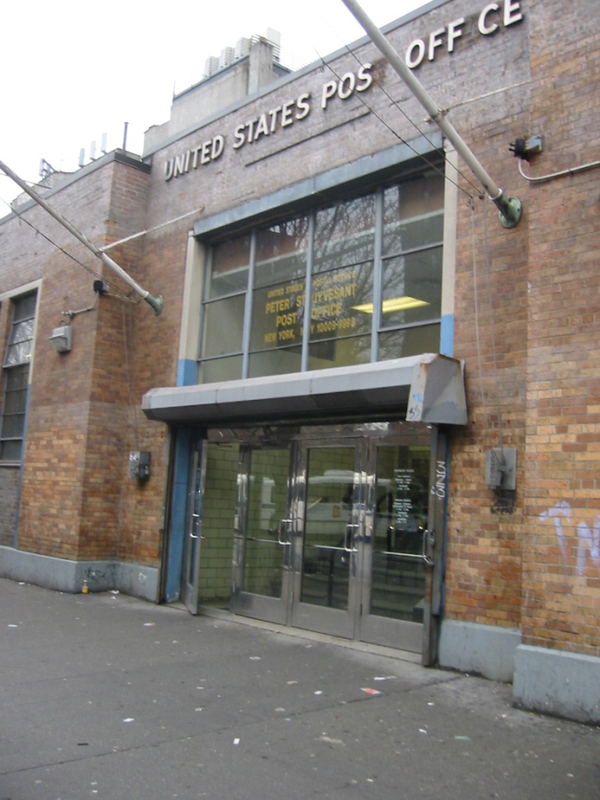 to move and downsize was a hotly contested one with Stuy Town and East Village residents packing a meeting to argue that as it was, the post office was a busy one with lines that frequently spilled out the door. 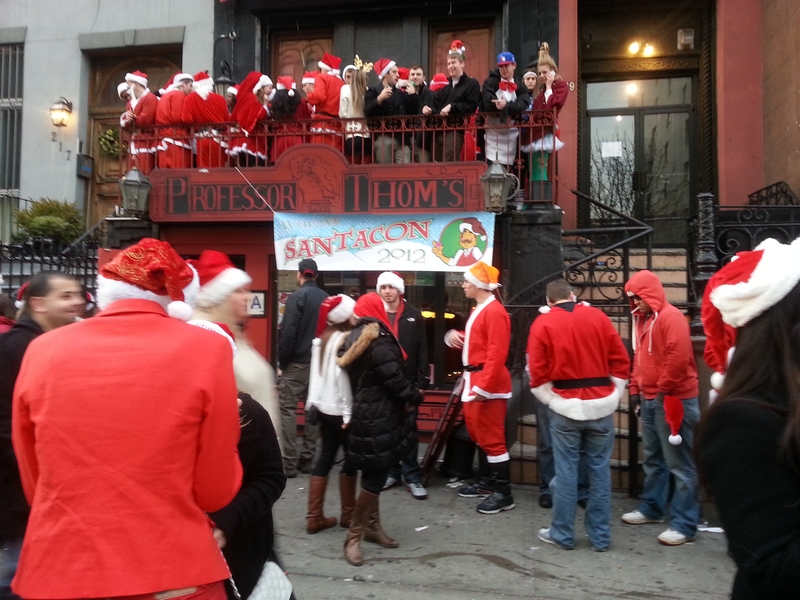 The lease will be up in that space, 432 East 14th Street, in February of 2014. Initially the U.S.P.S. said a decision was made to leave after the agency was unable to come to an agreement with the owner, but a rep for the owner said it was actually the Postal Service’s decision to leave because of a desire to downsize. The agency has cited the fact that it’s losing money, which a union for its employees has blamed not on a drop in the volume of mail but a federal law passed in 2006 that forces the U.S.P.S. to fund its employees’ pension plans 75 years in the future, costing it $5.5 billion a year. Congresswoman Carolyn Maloney, who believed the busy post office had to be making money regardless, said she asked the agency to review the branch’s financial information, and was refused. Following a contentious meeting held earlier in the month by the Stuyvesant Town-Peter Cooper Village Tenants Association, during which the group’s attorney advised tenants not to accept an MCI reduction offer from CWCapital, the special servicer reached out to tenants to discuss terms. In letters slipped underneath doors in ST/PCV on Friday, CW offered to reduce the cost of the retroactive portions of recently issued MCIs (major capital improvements) by 35 percent, as long as tenants agreed not to try to challenge them. There was also an offer to reduce $15 million on other costs. However, the letter then went on to indicate that CWCapital could end up backing out of the deal. The Tenants Association, meanwhile, has also taken issue with a series of MCI information workshops being held this week by CW representatives at 360 First Avenue in Peter Cooper Village. In an email to neighbors, the TA blasted the workshops as a ruse to get tenants to sign CW’s agreement rather than inform them about how MCIs work. 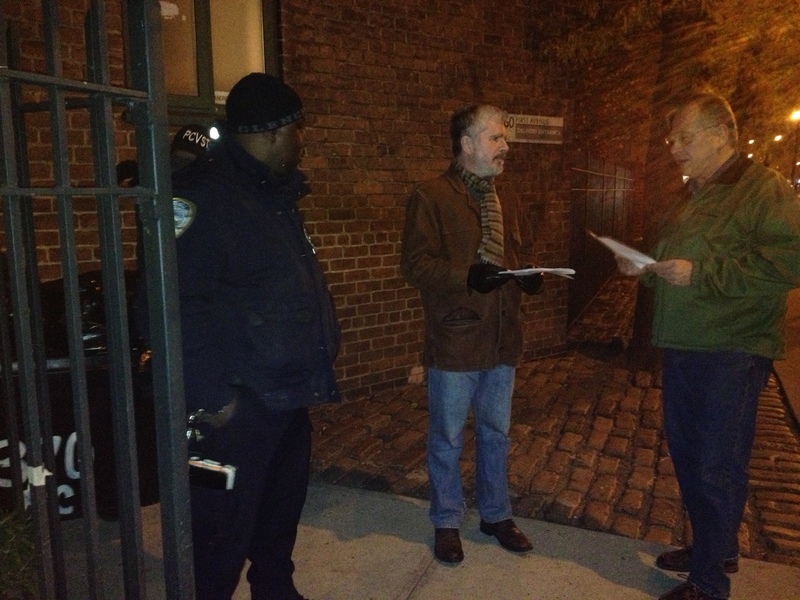 On Monday evening, the first of the series of workshops on MCIs saw only a trickle of tenants coming in and out, as well as a few volunteers for the Tenants Association standing outside the building, hoping to talk neighbors out of signing any deal with the de facto owner. One reason for this is that as of Friday, the state housing agency, the Division of Housing and Community Renewal (DHCR) of New York State Homes and Community Renewal (HCR), has agreed to the TA’s recent request for reconsideration of MCIs for five projects that were authorized by the agency. This means tenants are not yet responsible for paying the retroactive portion, though they will be expected to pay the monthly cost that’s added to their rent in perpetuity until the agency makes a decision. MCIs are for work done in 2009 by Tishman Speyer on security upgrades, resurfacing, doors and water valves and tanks. All the MCIs are added to the tenants’ monthly rent with costs varying based on the room count of apartments and whether they’re in PCV or ST, and all have retroactive portions that date back to 2009. The TA is hoping to challenge the MCIs based on the fact that Collins’ arguments made against them to the DHCR last year were not even acknowledged in the recent awarding of the increases to CWCapital. Additionally, Collins cited violations in some of the buildings, student housing in some apartments and shoddy workmanship on the resurfacing work as well as other factors. The reconsideration means the TA will not yet be filing a petition for administrative review (PAR), as it had previously planned to do. However, the group is still collecting signatures from neighbors for pledges that would authorize the TA to represent tenants if it does file a PAR, which according to TA Chair Susan Steinberg, will most likely happen. “We’ll pursue it as far as we can carry it,” she said. Over the years, the state housing agency has rejected almost all of the Tenants Association’s MCI challenges. 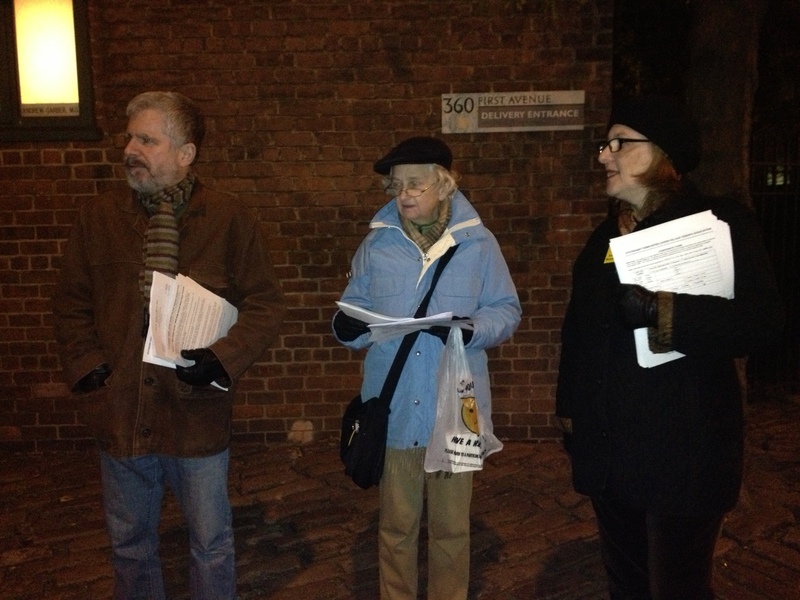 However, as of Monday, the Tenants Association had collected over 2,000 signatures on its pledge. While outside the MCI workshop, TA reps, including Steinberg and TA President John Marsh asked residents leaving if they thought they’d be accepting the offer for a retroactive MCI reduction, and a few were undecided. One man, who moved in last year, said he was concerned that he would have to pay the retroactive portion of the MCI despite being a new tenant. A TA volunteer responded to say he thought the owner would instead have to hunt down the previous tenant to try and collect that amount, though he added something Collins had said at the recent TA meeting, which is that owners making such moves happens pretty rarely. “I used to sell TV shows, and I learned from my boss I can’t respond to a non-offer,” she said. When asked what she was told at the workshop, another woman, who said she didn’t know if she’d be taking the deal, said she was told that she’d have to pay “a lot higher” of an amount if she didn’t. Attending was worthwhile though, she said, since she got useful information about her own particular situation — and extra incentives to sign. Still, she thought she would most likely not take the deal. John Sicoransa, one of the TA volunteers outside, said that neighbors of his who are “Roberts v. Tishman Speyer” class members “are utterly confused” by the offer. Being former market rate tenants, they hadn’t received notices in 2009 about pending MCIs, which are for rent-stabilized tenants, though they did get the recently issued letter from CWCapital. Additionally, “the post-Roberts people got them,” said Sicoransa. Future MCI workshops being held by CWCapital will take place on Thursday, November 14 from 5-8 p.m. and Friday, November 15 from 8:30 a.m.-11:30 a.m., both at 360 First Avenue. A spokesperson for CWCapital did not respond to requests for comment about the MCI workshops. However, the rep, Brian Moriarty, commented on the offer to say it was done in “good faith” and also noted that tenants’ appeals over previous MCIs haven’t gotten them much. Marsh, meanwhile, in a written statement, blasted the offer as “an attempt to legitimize an unenforceable scheme” to get tenants to waive their right to challenge MCIs. The Tenants Association’s MCI pledge is currently on its website at stpcvta.org. New Yorkers elected a new mayor for the first time in 12 years this past Tuesday and for the first time in over 20 years, made a Democrat the city’s leader. The New York Times called the election for Democrat Bill de Blasio based only on exit poll data because the margin was so wide. According to the unofficial results from the Board of Elections, the city’s current public advocate received 73.34 percent of the vote and Republican Joe Lhota received 24.27 percent. Current Manhattan Borough President Scott Stringer also enjoyed a landslide victory in the city comptroller race, getting about 80.53 percent of the vote. His Republican challenger, Wall Streeter John Burnett, got only 16.63 percent. Locally, City Council Member Dan Garodnick was able to retain his seat with 70.25 percent of the vote over Republican newcomer Helene Jnane, who got 29.75 percent. 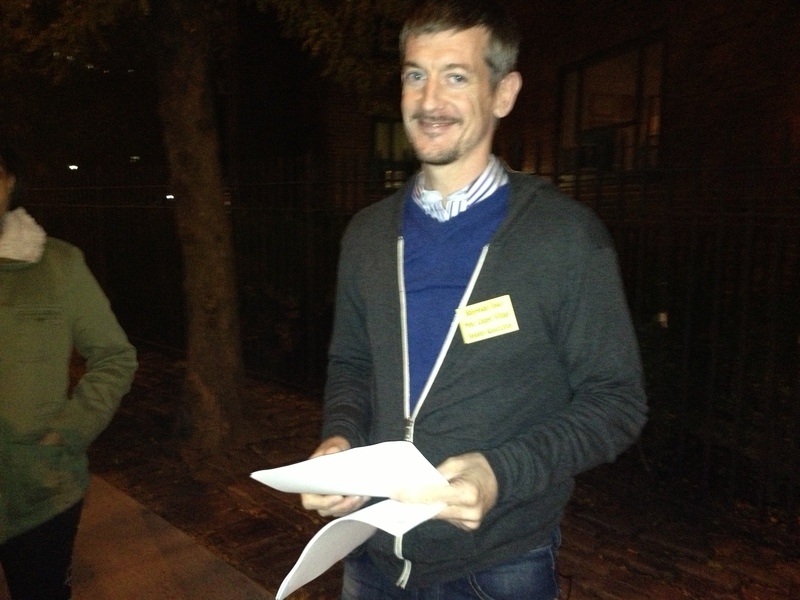 At the polls, some voters felt it was important to vote because of issues such as tenants’ rights. 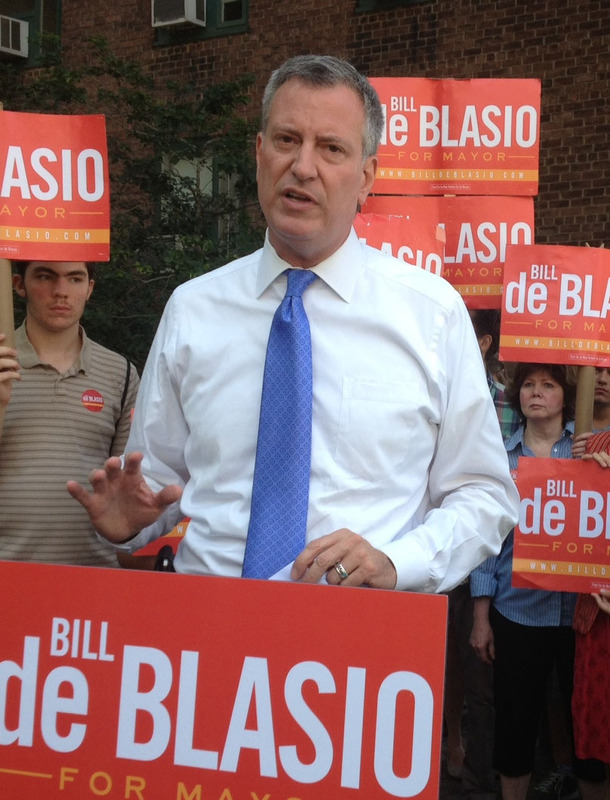 A number of residents, however, were motivated to cast their ballots because of Bloomberg fatigue. The Board of Elections approved a decision in mid-October to use six-point font on the ballots for this election and a number of elected officials have come out against this move because it makes the ballots more difficult for voters to read. One poll worker stationed in the site at 360 First Avenue said that voters were making complaints about how difficult the ballot was to read all morning. Garvey, who voted at the community center polling site, said that she didn’t have too much trouble reading the ballot, but she worried that seniors might. “The proposals are a very important part of voting and the font for those is so small,” she said. As with elections in the past, redistricting in the neighborhood has shuffled polling sites around, sometimes leaving residents confused about where they were supposed to vote. Madge Stager, a Stuyvesant Town resident who voted at the community center, said that it took her 20 minutes to figure out where she was supposed to go because she went to her regular polling place and only then discovered that the site had changed. She ultimately figured out that she was supposed to vote in the community center at 449 East 14th Street but said that she never received any notice about a change, and the site coordinator at the community center, Donna Canton, said that polling places have been changing frequently. Other than these few hiccups, poll workers said that everything was going relatively smoothly on Tuesday morning. 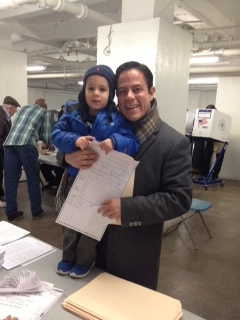 They noted that voter turnout was heavy and the residents that came out were more than happy to do their civic duty. Was that an offer or a threat? As if receiving multiple MCIs that have been sitting on the DHCR’s desk without proper action and due process for years were not enough for tenants to cope with, management has taken this opportunity to instill fear and more insecurity in tenants by distributing a rather ambiguous letter not easing but adding to the confusion. Even if all of the MCIs were to be found correct after due process, which obviously was omitted by the DHCR, the law allows the landlord to only add a specific percentile of retroactive charges to the monthly rent. The management seems to tell the tenants that if they don’t comply with their request as stated in this letter they might be faced with paying thousands of dollars all at once or as management sees fit. If this is not fear mongering and harassment, then what is? Apparently they think tenants are so afraid and ignorant of existing laws that they will just shut up and comply. This is certainly not a conciliatory way of solving this issue. 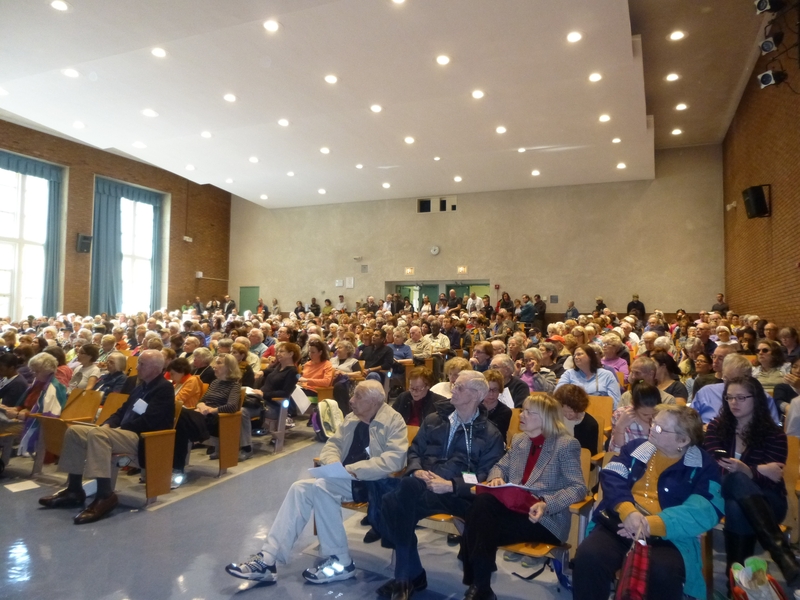 Tenants pack a meeting on MCIs, held at the Simon Baruch Middle School auditorium. After residents were hit with five MCIs (major capital increases) in October for upgrade projects in Stuyvesant Town and Peter Cooper Village, management firm CompassRock made an offer to try and reduce the retroactive portions of those increases — an offer that the Tenants Association swiftly responded to, to suggest that neighbors ignore it. 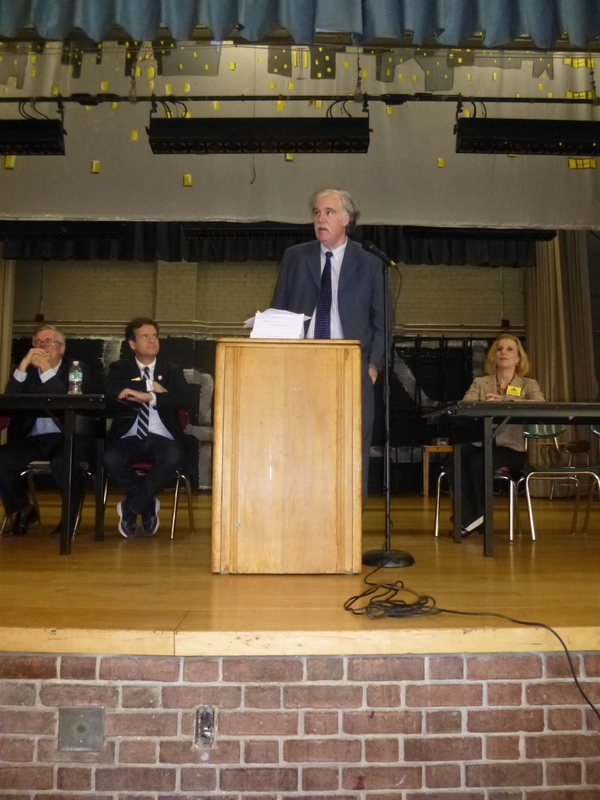 The MCIs were discussed by the Tenants Association’s attorney Tim Collins at a meeting held on Saturday at the Simon Baruch Middle School auditorium. 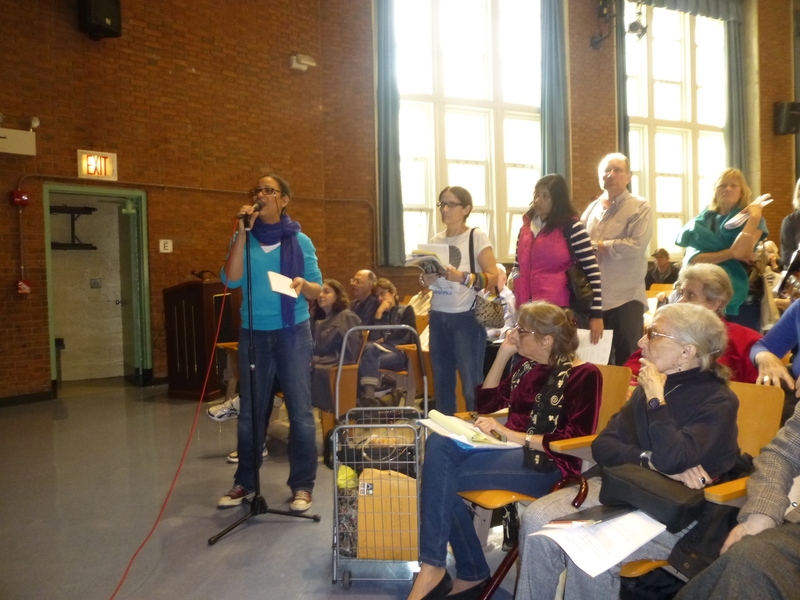 This meeting, which was attended by around 500 people, took place a day after tenants received a letter from CompassRock, which mentioned that management hoped to work with tenants to lower the amount of retroactive charges in the MCIs “in order to mitigate the impact of this component for our longer term residents.” It also mentioned that some residents — those whose legal rent is higher than their preferential rent (what they actually pay) — shouldn’t see any increases at all. However, the letter, which was unsigned, then went on to warn tenants that though they have a right to challenge the MCIs, if they did, they could forget management’s offer to try and reduce the retroactive portion, and that even if tenants did appeal, the MCIs would still likely be approved. “It is our belief based upon legal advice received that at the end of any appeal process, we will obtain all or almost all of the amounts reflected in the orders,” the note read. CompassRock then went on to say management hoped to address the issue with tenants over the next few weeks so the proper amount of rent could be issued in the December bills. “We hope that our residents take this letter as it was intended — not as a formal legal offer, but as a gesture of our good faith and a commitment from us to mitigate the effect of these orders,” said the note. A few residents told Town & Village they thought the letter had a threatening tone, and later, Brian Moriarty, a spokesperson for management and special servicer CWCapital issued a statement, explaining that the offer was made to avoid any conflict with the tenants. But at the meeting, Council Member Dan Garodnick commented on the letter to say that he thought the offer to reduce the retroactive amounts — but not the monthly increase that would be charged in perpetuity — was only made because the monthly increase is added to tenants’ base rents. This would bulk up the property’s rent roll, which would be attractive to a potential buyer, noted Garodnick, while the retroactive charges “do nothing for that. Collins also spoke about the offer to say he was confident that the MCIs would be rescinded if appealed due to the fact that his arguments on behalf of the TA on why they shouldn’t be implemented, which were made last year, weren’t even acknowledged in the responses. Previously, he referred to this as a “reversible” error. He added that complaints include the TA’s belief that since some of the work benefits ST/PCV’s commercial tenants, they too should share in the cost and that in some buildings, there were “class C” violations found, which would make the owner ineligible for an MCI. There was also the issue that some apartments were being used for student housing. Another argument, specifically against the resurfacing MCI was due to the quality of the work. Decisions on whether to grant MCIs are made by the state housing agency, the Division of Housing and Community Renewal (DHCR) of New York State Homes and Community Renewal (HCR). The applications for the MCIs were made in 2009 by then-owner Tishman Speyer for security upgrades, including a now destroyed command center and video intercoms in Stuyvesant Town as well as (for Peter Cooper residents) work on water valves and tanks and (for Stuyvesant Town residents) resurfacing work which was bundled with charges for doors and water tanks and valves. Costs of the different MCIs vary per tenant, but all include retroactive portions to account for the time from when the work was done to when the decision to authorize the MCI was granted. Only half jokingly, when Collins took the podium, he slammed down a pile of paperwork that was about six inches thick. Collins then told the audience that if he wasn’t confident about getting results from the HCR, he wouldn’t have shown up at the meeting. 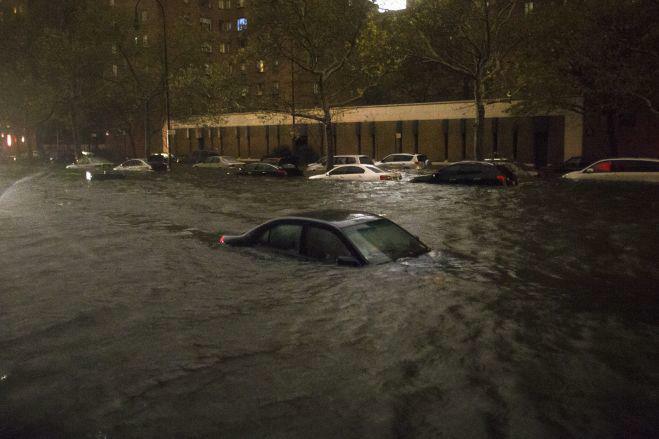 “I would not have canceled my proctologist appointment,” he said. The attorney also asked residents to sign a pledge, which would allow the TA to represent them in a joint petition for administrative review (PAR). Collins has asked that tenants not file their own PARs, unless they have “unique circumstances,” since the TA believes a joint argument will have more strength. The TA is also preparing another document called a request for reconsideration. On CW’s current offer to tenants, Collins said it could later cause increases for tenants whose preferential rents are lower than the legal rents, which are the maximum amounts an owner can charge. Along with Collins, other speakers at the event, which was emceed by TA Chair Susan Steinberg, included local elected officials such as Garodnick, Assembly Member Brian Kavanagh, Congress Member Carolyn Maloney, Borough President Scott Stringer and State Senator Brad Hoylman. Following statements from local elected officials, tenants then lined up to ask questions about the MCIs, the overall theme of which seemed to be: What can be done to stop them and why is CWCapital entitled to money for work that was paid for by Tishman Speyer? “CW is nobody who actually spent money on the major capital extortion, I mean improvement,” griped one tenant. In response to the latter question, Collins said that it was standard that a new owner step into the shoes of the old owner. As for the former question, Kavanagh responded to say the answer was in restoring home rule from the state to the city, because in the state legislature, many of the politicians making decisions on city housing law live outside the city with few rent-regulated renters as constituents. When another resident asked if tenants could be socked with yet another MCI for the ongoing renovation of the storefronts on First Avenue, the answer was no, because it doesn’t benefit all tenants. Another resident, introducing herself as Emily Juno, said she’d lived in the community for 18 months and was never notified about a pending MCI. She added that she had neighbors who’d told her the same. In response, Collins said she wouldn’t have to pay it in that case, but also cautioned her to check her lease and any riders to make sure there was no reference to an MCI. A resident named Liza Sabater, who said she’s raising two children in Stuyvesant Town, said she had a “mundane” question, which was that she didn’t even know the amount to put on her rent check. The wording in the MCI documents made her wonder if her rent had been increased by over $1,000, but Collins said no one’s rent had gone up that high, because the monthly MCI payments are capped at six percent of whatever each tenant’s rent was in 2009. A longtime resident, Tom Hickey, said he didn’t believe the resurfacing MCI was valid because he recalled similar work being done at the turn of the millennium. (Later, he said he filed his own objection in 2009 to the housing agency since the last resurfacing was actually done in 2003 or 2004 by Met Life.) Didn’t this, Hickey asked, mean the 2009 project occurred before the prior resurfacing had completed its useful life? Collins said he’d check to see if that information was included in his objections. Following the meeting, Steinberg said that the TA had collected around 750 signatures on its pledge for a joint challenge of the MCIs, but said the association was still looking for more and would be putting the pledge online on the TA website (stpcvta.org). In related news, Hoylman, Garodnick and Kavanagh wrote a joint letter to HCR Commissioner Darryl Towns, expressing their concern over the recent flood of MCIs, asking that they be reviewed.